A look at developments in the stronghold of Mahinda Rajapaksa’s southern region of Hambantota. In January 2015, when Maithripala Sirisena surprisingly defeated Mahinda Rajapaksa in Sri Lanka’s presidential election, the country was seemingly turning over a new chapter in its bloody recent history. In October 2018, President Sirisena’s decision to suddenly oust his prime minister, Ranil Wickremesinghe, replacing him with former strongman Rajapaksa, threw the country into a fresh constitutional crisis. Throughout the country, particularly in the south where Rajapaksa comes from, he enjoys new widespread support. 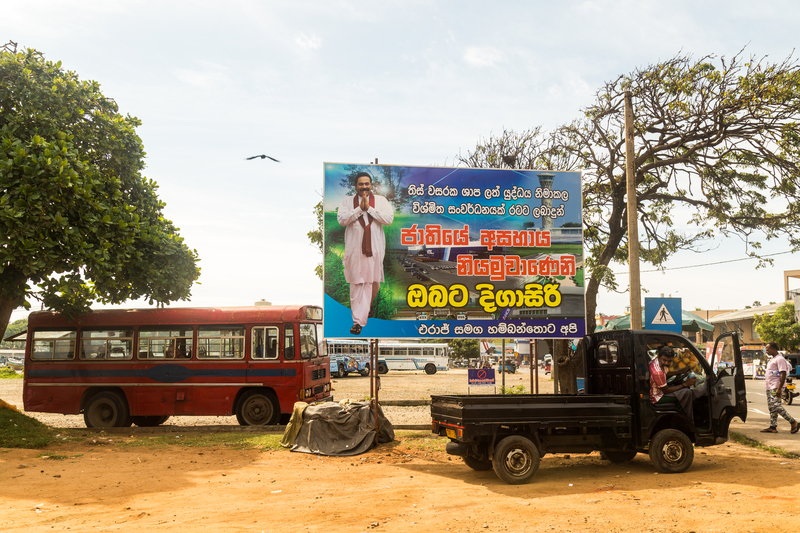 In virtually every village, dozens of large posters positively portray Rajapaksa. While president, one of Rajapaksa’s key controversial projects was the building up of Hambantota port at a cost of close to $1 billion. In December 2017, after Sri Lanka was not able to pay its debts, it agreed to hand over the port to China on a 99-year lease. 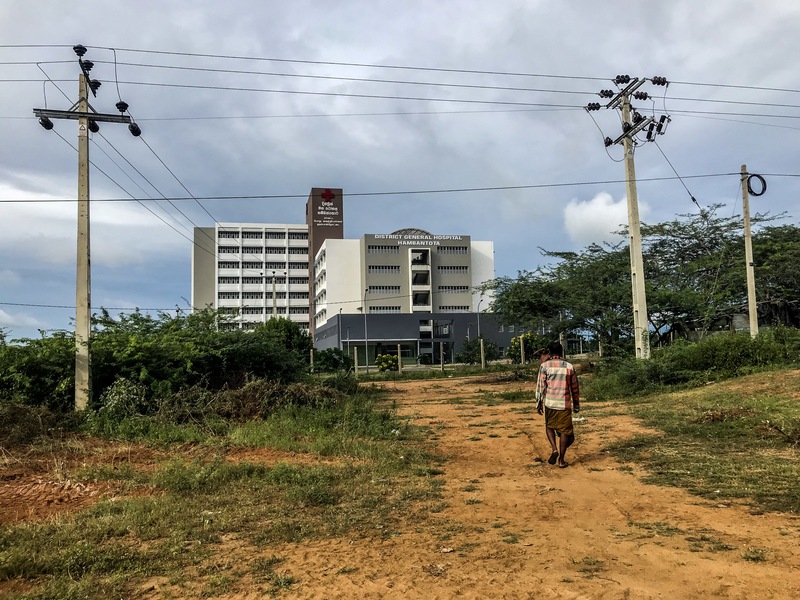 For this piece, I went there to take a look at things that were already built and what state they are in, and what is being built, and a look at the highway that will connect to the Hambantota port. In stark contrast to Hambantota are the newer projects launched in Colombo that are transforming the face of the capital. On November 29, Sri Lanka and China signed two multimillion dollar deals for port upgrade projects in Colombo. On December 15, seven weeks after Sirisena appointed him, Sri Lankan Prime Minister Mahinda Rajapaksa conceded that he didn’t have parliamentary support and resigned. He has since taken up the role of opposition leader. The reinstatement of Wickremesinghe to the prime ministership and the appointment of a new cabinet means the government will once again function. But tensions remain between Sirisena and Wickremesinghe, ensuring the political crisis is not entirely over. Out of power (again) for now, Rajapaksa, who dominated Sri Lankan politics for a decade until 2015, remains very much in the picture with widespread popular support. All the while, construction of the Hambantota port and affiliated projects continue. Nicholas Muller is an American photojournalist and writer. 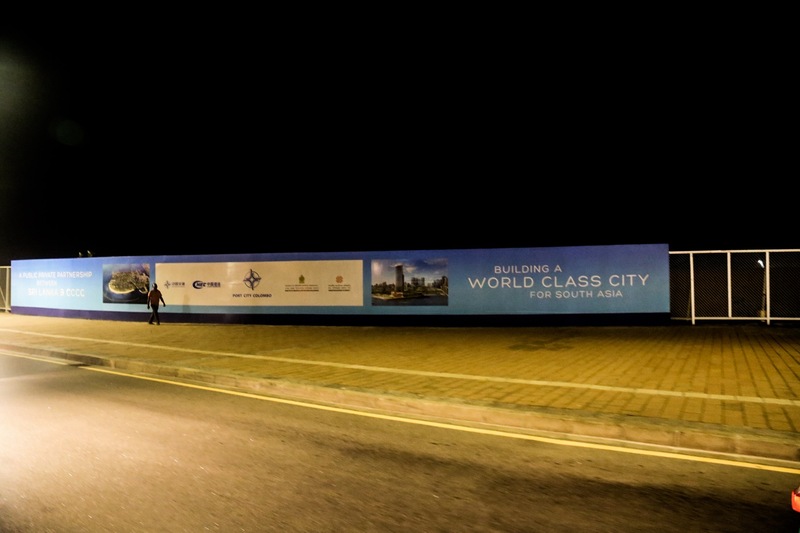 A large sign of Mahinda Rajapaksa in the city of Hambantota where the Magampura Mahinda Rajapaksa Port was built, financed by the China Harbor Engineering Company, one of China’s largest state-owned enterprises. After the Sri Lankan government struggled to pay down the debt on the billion dollar port project, it handed the port over to China on a 99-year lease along with thousands of acres of land around Hambantota. 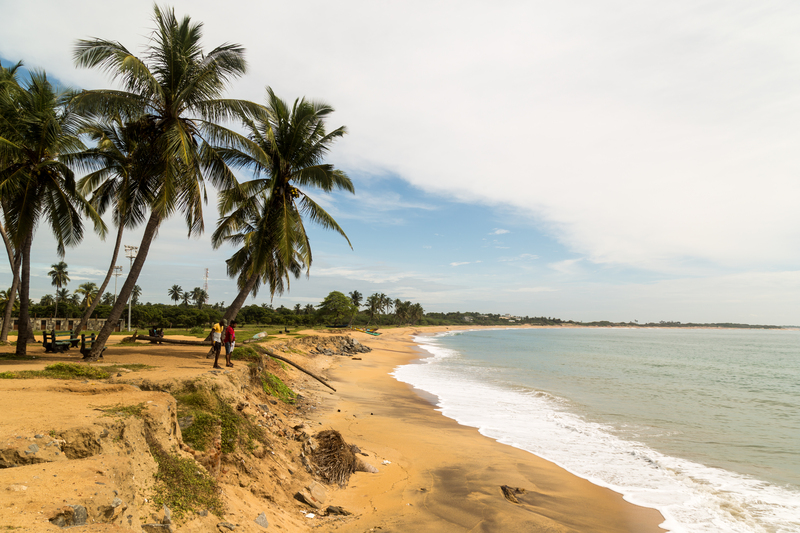 An undeveloped beach in the city of Hambantota next to the old fishing port area. Currently there is little to no development in this area or next to the new Chinese-controlled port except for a few fisherman who use it to launch fishing expeditions. A traditional fishing boat (dhow) locals use to fish in the area is painted with the Chinese flag in the foreground. 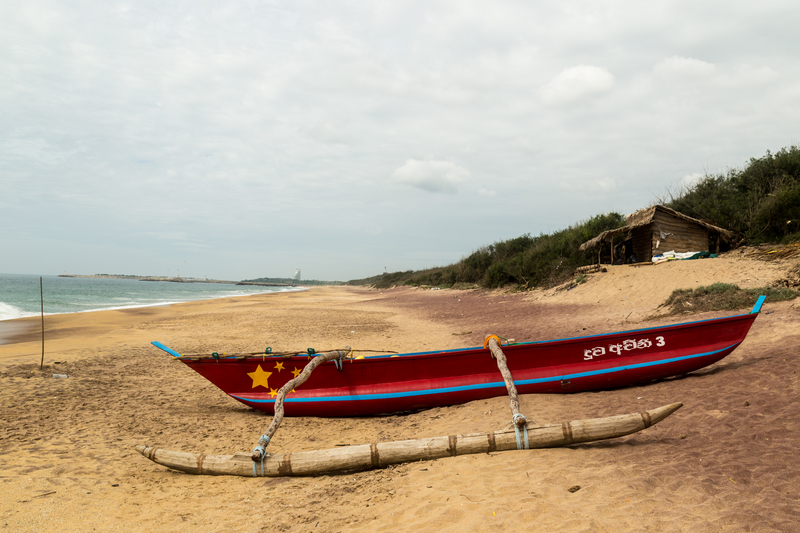 In the background is a fisherman’s hut and the entrance by sea to the Chinese-controlled Hambantota port. Major development of this coast is expected in the coming years. A group of fisherman who live collectively here on the beach next to the new Chinese-controlled port. 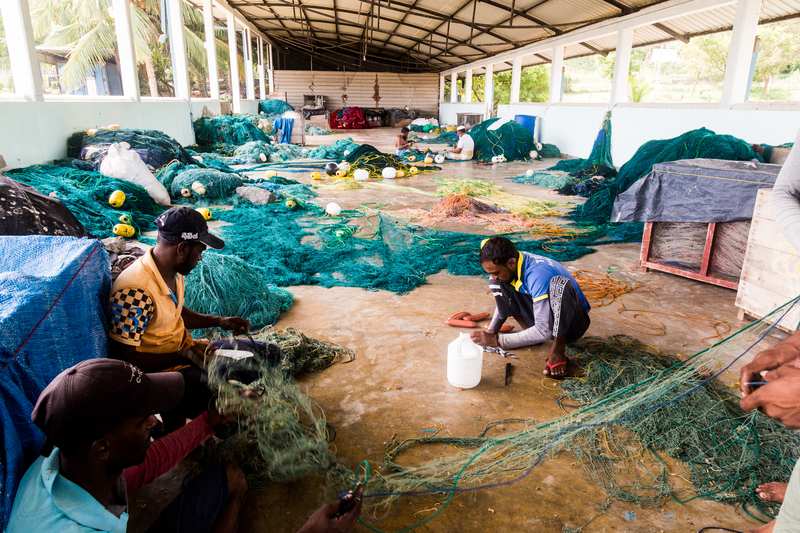 They go out several kilometers to sea to fish for weeks or months at a time and say that they have seen their fishing increasingly restricted in the area adjacent to the port. 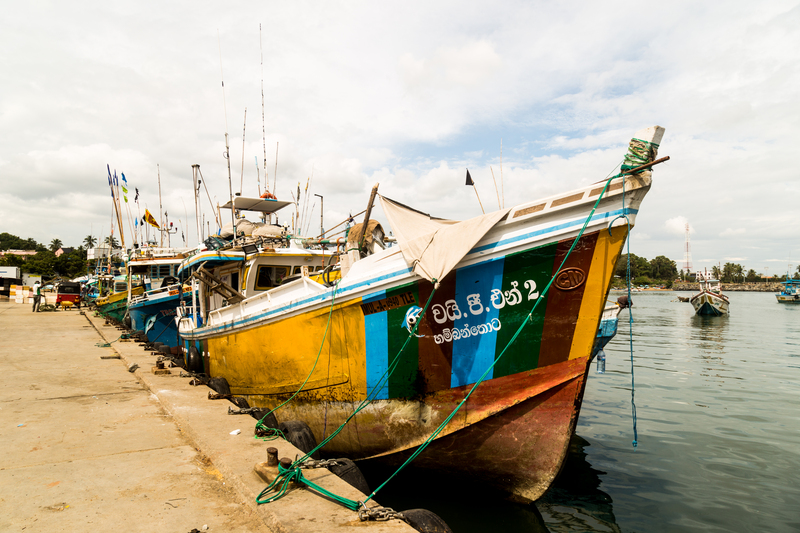 An traditional fishing boat parked in the old fishing port of Hambantota. 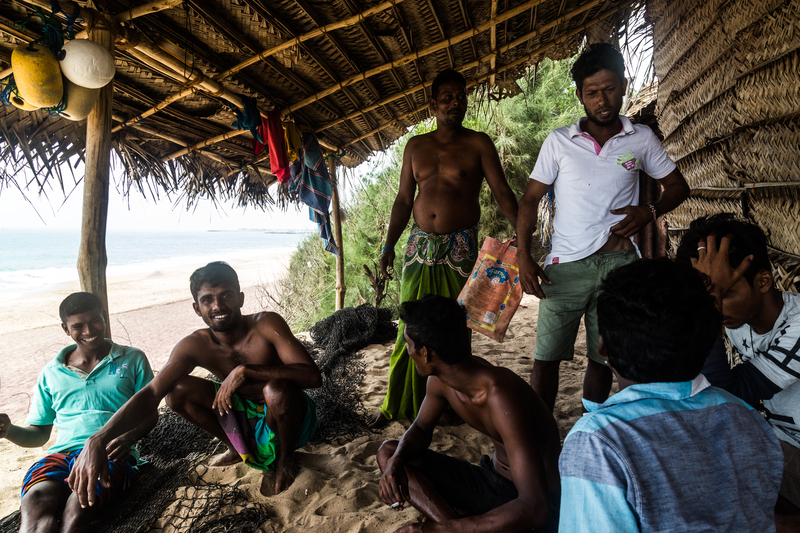 Despite the dangerous work and very little pay, residents of Hambantota heavily rely on fishing for their livelihoods. Local fisherman expect this to change in the coming years as more development comes. Fisherman at the port untangle their nets for hours a day after coming back from sea to prepare for their next fishing expedition. The fisherman say they go out in groups of several boats for safety from other ships. The work is difficult and locals make around $100 a month. 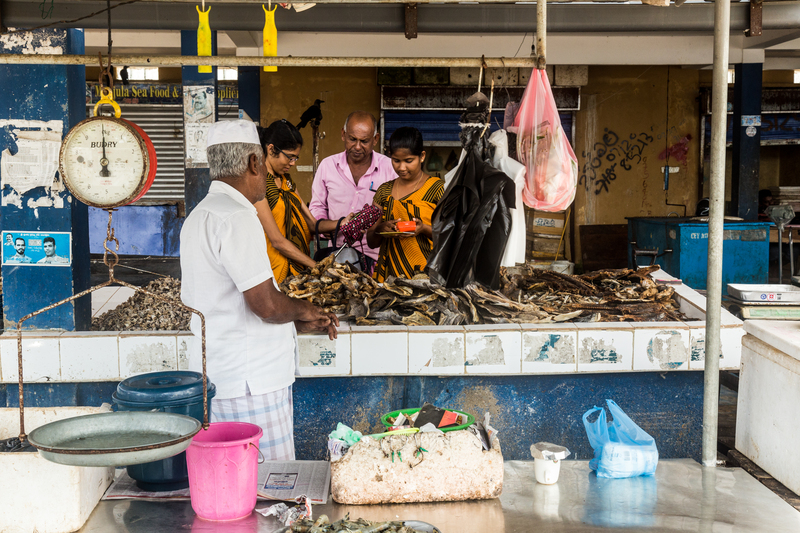 A family buys fish from the market next to the fishing port at Hambantota. Although major development is taking place, it remains one of the poorest regions in the country. 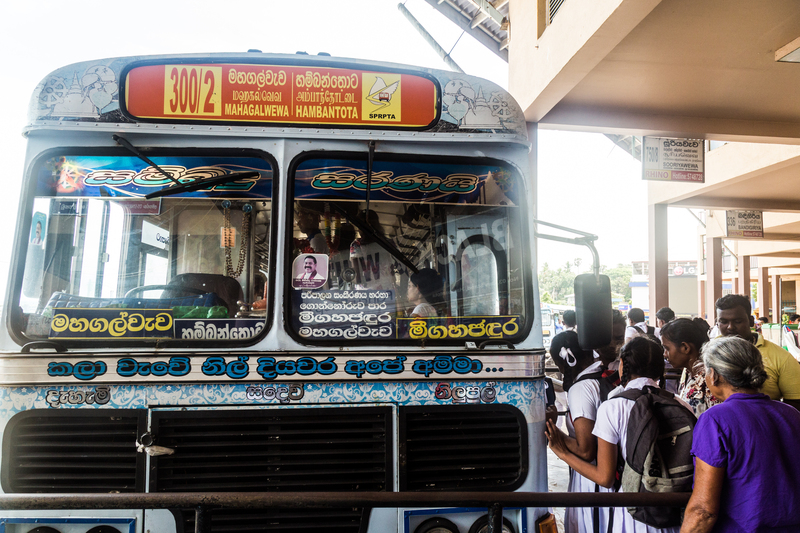 Locals board a bus at the Hambantota bus station. The area is a base of support for Rajapaksa and his portrait can be seen in almost every bus and village. 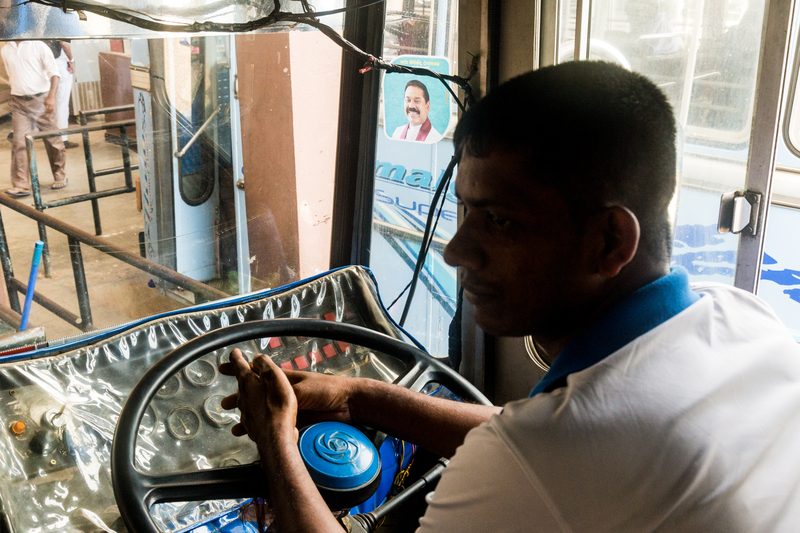 A portrait of Rajapaksa inside a local bus in Hambantota where he enjoys widespread support, particularly more visible again after being appointed prime minister in October -- a move walked back a few weeks later. 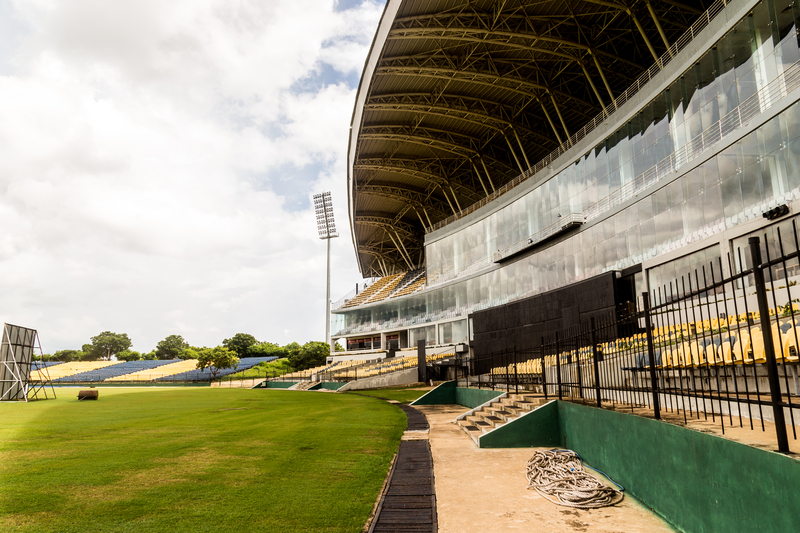 The Mahinda Rajapaksa International Cricket stadium was opened 30 kilometers away from Hambantota in 2011 as part of a Rajapaksa-era plan to develop Hambantota. The district is the constituency of Namal Rajapaksa, Mahinda’s son, and the cricket stadium was a dream of his which cost hundreds of millions of rupees. For most of the year, the 35,000 seat stadium sits empty and there is little else in the surrounding village. Some international matches have been hosted at the stadium but only rarely. There are signboards in Chinese and a Huawei booth. After the new highway is completed, travel time to the stadium will be significantly cut down. A new overpass being constructed and financed by Chinese loans will create an expressway running directly to the Hambantota port. 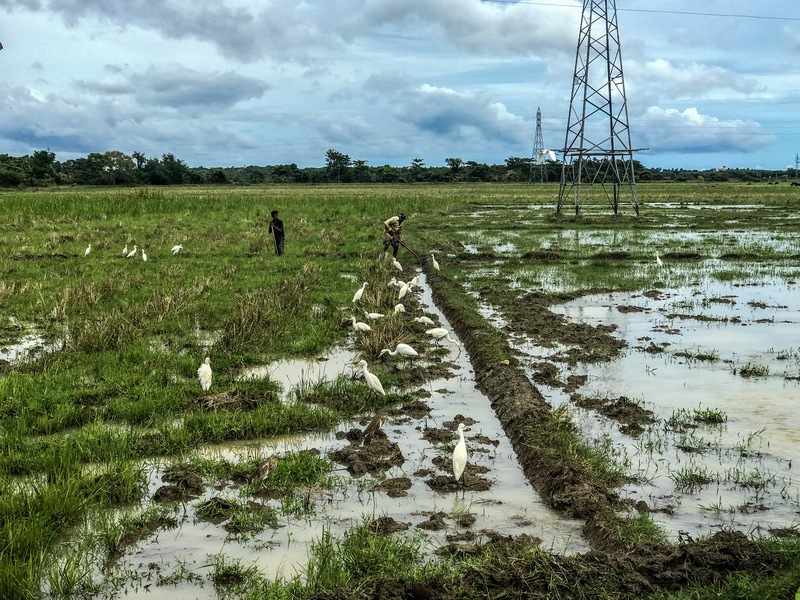 The highway cuts through farmland, rice fields, and areas where elephants commonly pass through close to Yala National Park and several other animal areas. 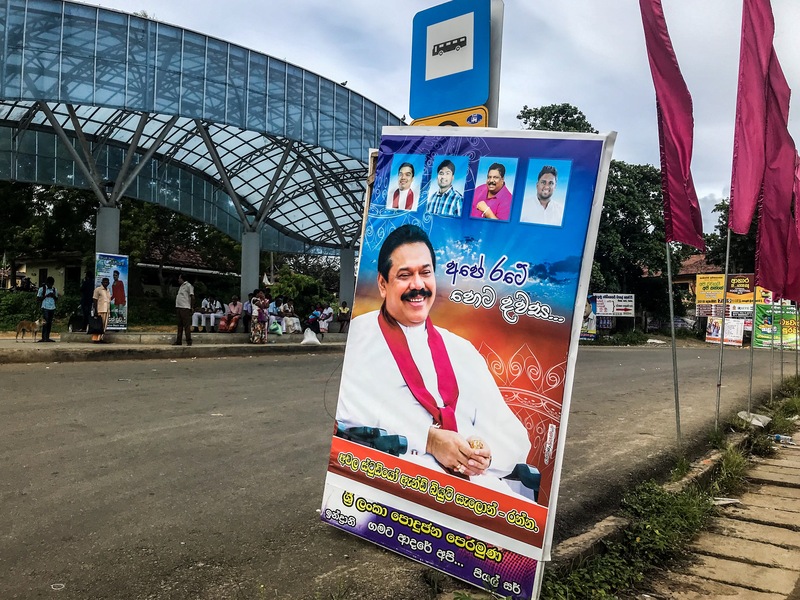 A giant poster of Mahinda Rajapaksa along the highway between the city of Matara and Hambantota, a stronghold of the former president’s support. More highway construction of the new multilane overpass being constructed and financed by Chinese loans. 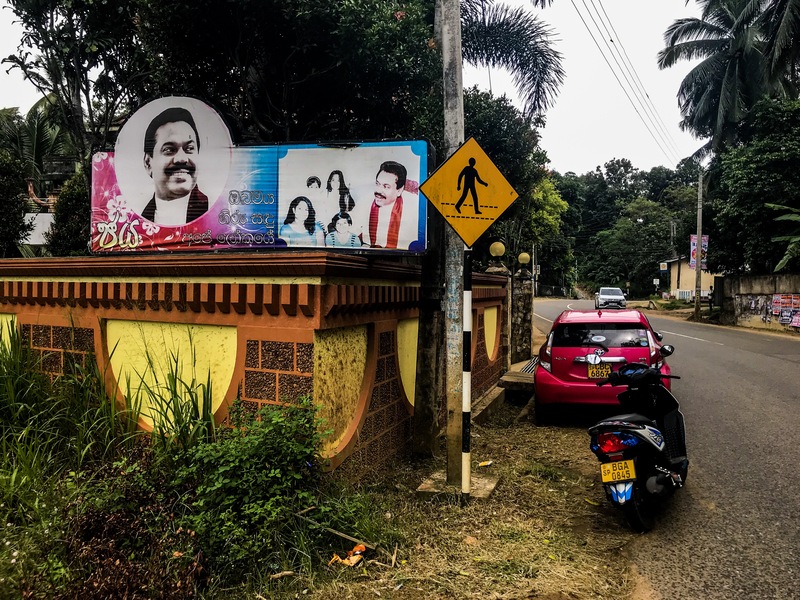 Images of Rajapaksa can be seen in virtually every village in the southern areas of Sri Lanka, where he enjoys the strongest support. This one is on the way to his hometown of Weeraketiya, which is 15 kilometers away from the coastal city of Tangalle and an hour from the city of Hambantota. The town will be conveniently connected by the new highway extension. 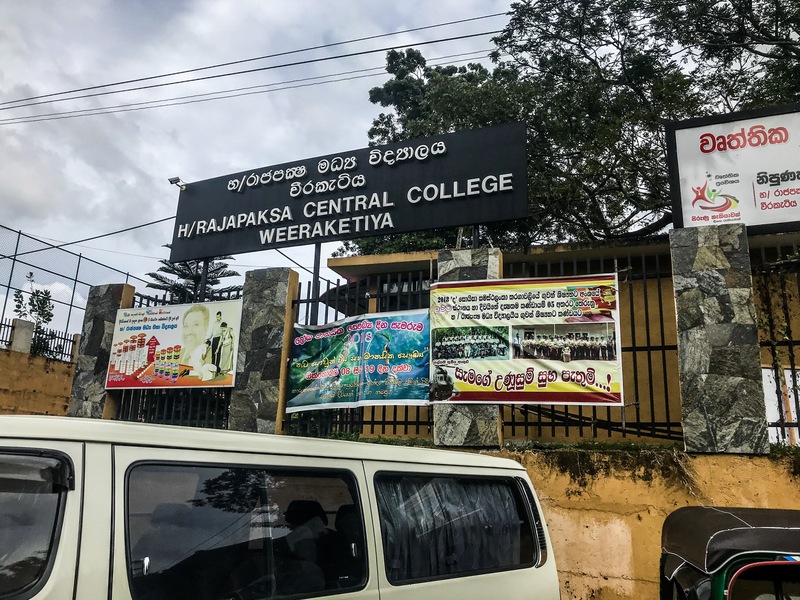 A college in Rajapaksa’s hometown of Weeraketiya is named after him, like many things in the region. 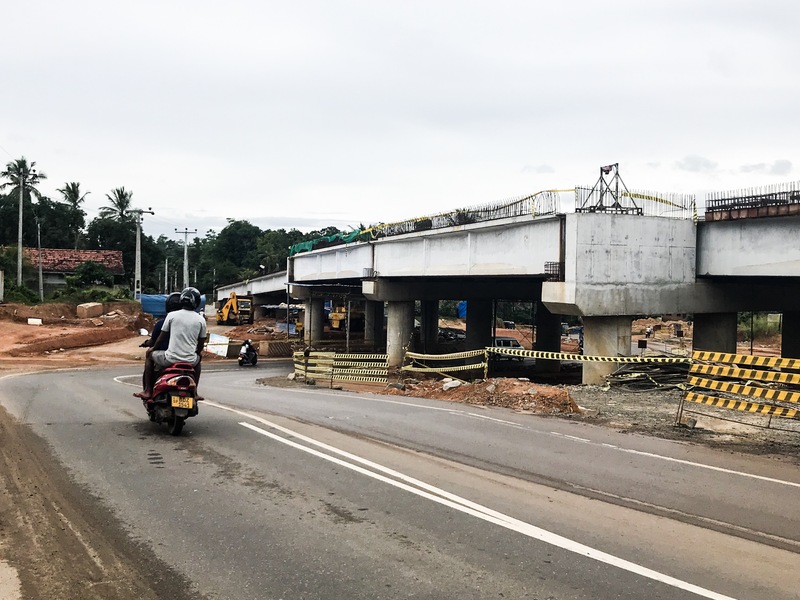 A new multilane overpass being constructed and financed by Chinese loans will create an expressway running directly to the Hambantota port, cutting through farmland, rice fields and areas where elephants commonly pass close to Yala National Park and several other areas. 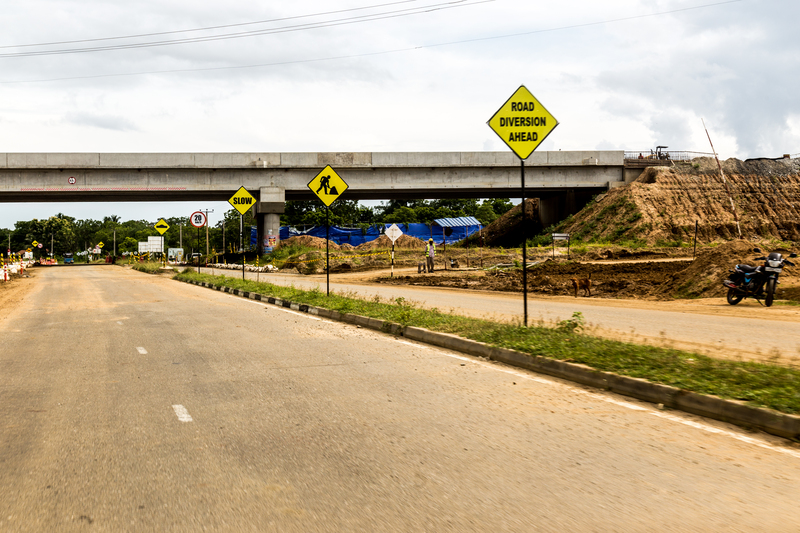 This part is right after leaving Rajapaksa’s hometown, which will be conveniently connected by the new highway extension to Hambantota. 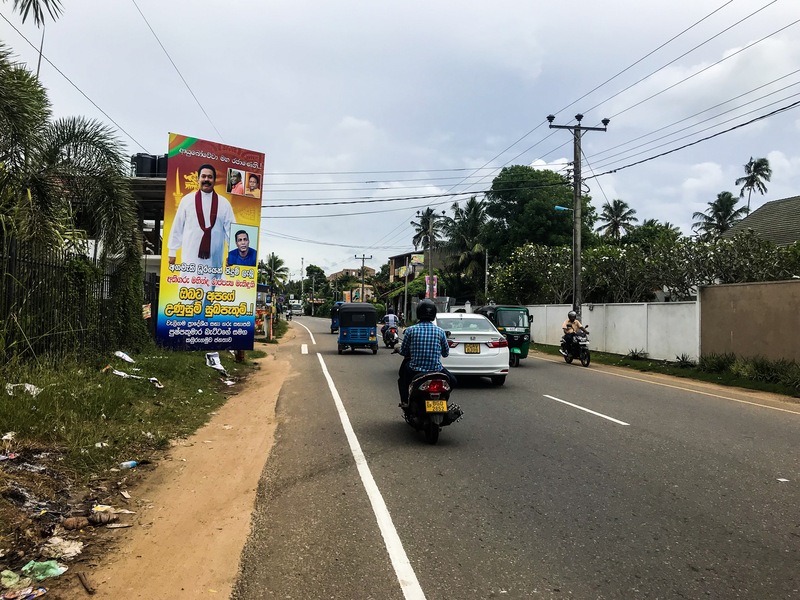 Images of Rajapaksa can be seen in virtually every village in the southern areas of Sri Lanka where he enjoys the strongest support. This one is at a bus stop in a village on the way to his hometown of Weeraketiya. The newly built luxury resort of Shangri La, which sits on the coast less than 10 kilometers by road to the Hambantota port. 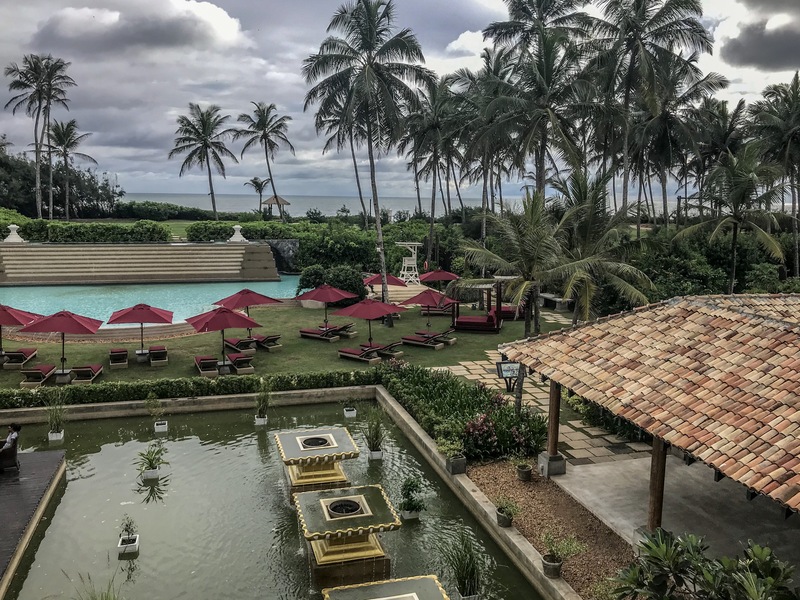 The luxury hotel spans several acres and has a golf course, which is expected to attract tourists and businessmen in the coming years as the area continues to develop. Currently it sits almost empty. The newly built hospital opposite the entrance of the Hambantota port. Currently the hospital sits unused. 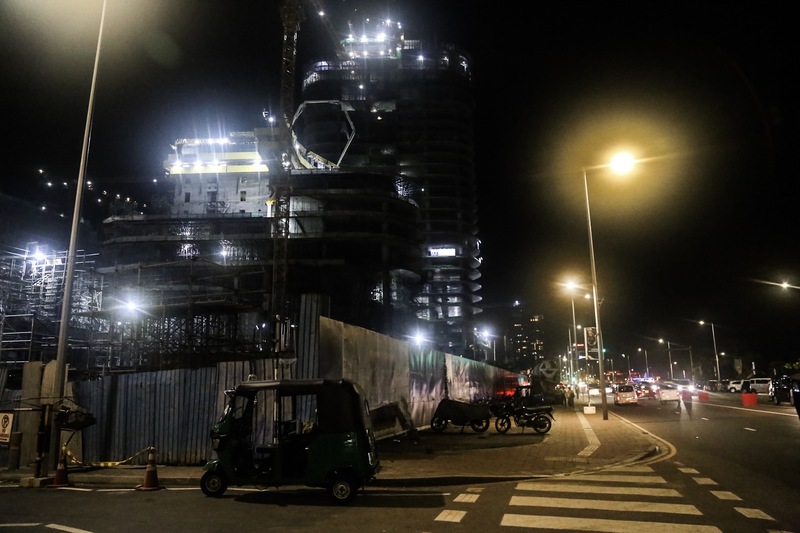 Construction on new high rises on the Colombo seafront, part of a construction boom financed by new Chinese investment and loans that will transform the capital’s skyline. At the end of November, Sri Lanka signed two multimillion dollar contracts with Chinese firms for port upgrade projects . This came amidst the height of the political crisis raised doubts over the legitimacy of the government and the newly signed deals. The Port City Colombo project financed by $1.4 billions of Chinese investment has ambitions to rival Hong Kong and Dubai. India has ceded influence in Sri Lanka to China. Could the upcoming election change that?